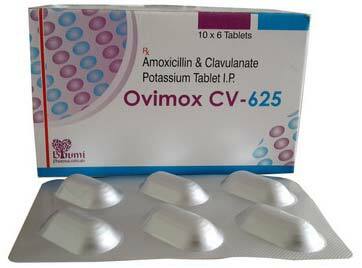 Amoxycillin & Potassium Clavulanate Tablets are used to treat or prevent many infections like respiratory tract infections, skin & soft tissue infections, etc. The Amoxicillin Potassium Clavulanate Tablets or Pharmaceutical Tablets that we make available are medically approved and are widely acclaimed for their compositional accuracy. Talk of price; we are known for providing the best quality at reasonable price. Eq. To Amoxycillin 500 Mg Clavulanate Potassium I.P. Eq. To Clavulanic Acid 125 Mg Excipients Q.S. Colour - Titanium Dioxide I.P.